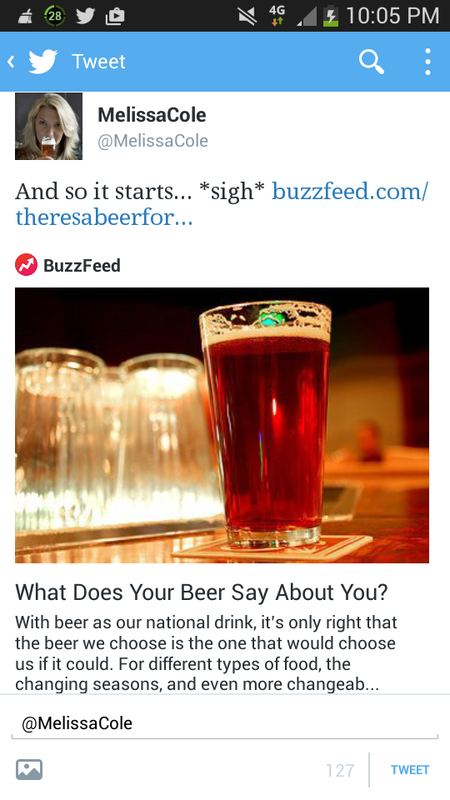 What Does Your Beer Say About You? You may have noticed my Hoposcope tweets, or you may have chosen to ignore them. If you were one of the people who rolled your eyes…then keep on rolling….that’s it…all the way over there….good. Lambic: Your best day of the week is Thursday and your best colours are those of the sea: blue, green, lavender and silver. Mild: Charming, elegant, stylish & romantic. Your best day of the week is Friday & your colours are gentle hues of blues, pinks and violets. Saison: Mesmerising, insightful, determined, resourceful & focused. Your best day of the week is Tuesday & your colours deep red and black. Black IPA: Quirky, determined, logical & eccentric. Your best colours are electric blue & anything metallic.You are ambitious & a good lover. Old Ale: Mentally nimble, analytical, constructive, meticulous and often linguistically gifted. Your colours are Earthy greens and browns. IPA: Bold, courageous, independent, enthusiastic, fun-loving & fascinating. Your best day of the week is Tuesday and orange is your colour. Best Bitter: Persistent, appreciative, dependable, practical and passive. Your best day of the week is Friday and your best colour, brown. Beer Blend: Funny, versatile, talkative, fast-thinking & sophisticated. Your best day is Wednesday & your best colours are yellow and lilac. Helles: Sensitive, argumentative, imaginative & forthright. You do not recognise days of the week, you idolise Bono & your best colour is mint. White Stout: You’re a maverick, misunderstood, you shoot from the hip & often too quick to judge. You love weekends and playing in the snow. Lager: Your friends often tell you you’re quick tempered, you don’t suffer fools gladly & you have a potty mouth. You enjoy long walks alone. Sour: In years to come your family will finally understand you. The flamboyant attire, erratic mood swings & pursed lips. Festivities bore you. I haven’t been this fresh for a while, not at this time of day, not this early in the week. Earlier today I was sat in a bar in my local City, everyone should have one. I drank a session lager beer, I drank a West Coast ideal and a Baltic dream. I ordered a pizza which promised transatlantic origins and boasted ingredients from across the road. I bought a bottle of beer from the fridge, a firm favourite. I spoke to the brewer. I contemplated the value of this transaction if I was to share it on social media. I joked with the chef. I knew there was no value in asking for a taster. I talked about 100% cacao, provenance and Christmas. I made an excuse to leave. I listened to Paul Simon’s Graceland and smiled at the fellow forlorn commuters. It’s an album I don’t listen to often enough. A firm favourite. Strike temp of 78C, 14.0L liquor for 5.05kg grain. 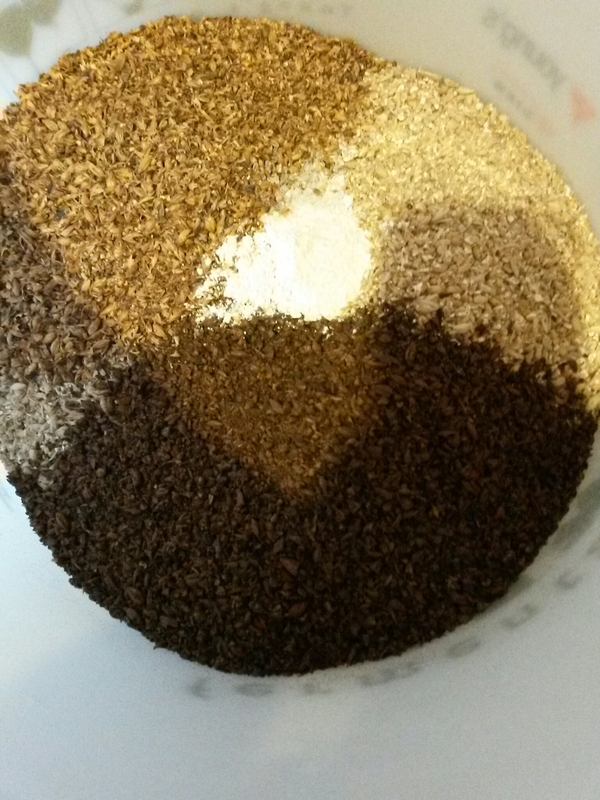 Mashed in at 68C (single step infusion). Mashed for about 9 hours but only because I went out on my bike…and was distracted by a couple of pubs. Sparged at 78C 22L liquor. I over sparged because I was distracted by my beer fridge. The IBUs will probably be a bit much for the ABV, but not to worry. 60 minute boil. I collected 24L of wort, post boil, with an OG of 1.052. Pitched the yeast at 20C. I’ll be adding the dry hops to primary. Bravo and Pacific Gem. Bottled 13/11/14 (19L 90g sugar batch prime). Craft – Is it just a beery buzzword? Are we all a little craft-ed out? Why it’s so much more than just a buzzword. It seems like wherever we go these days, we’re bombarded with the term ‘craft’. Craft beer, craft pies, craft pickles, craft sandals, craft beards – everything now comes in a ‘craft specific’ version. How sick are you of hearing about it? Sure, the hype may be annoying, but for many beer lovers, its meteoric rise is a good thing. The perfect middle ground between real and boutique, it’s a way to get all the thrills while getting a decent beer too. Of course, that’s what many of us were doing anyway, long before it was named in this way. It was just a case of assembling the pieces and putting together a concept that could be sold to everyone and not just the enthusiasts who’ve been modding their beers to their own specification for years. While the ‘C’ word has become a bit of an in-joke for those not easily swayed by the latest fashions, this ‘new’ brewing style has already helped deliver some pretty amazing things, from superb beers and bars, to new pub trails and opportunities to drink and to socialise. The huge success of the recent UK round of Craft Festivals, with their big crowds and positive vibe, goes some way to show the growing appetite for taking part in it as well. Craft has created a credible middle ground that’s helping to reinvigorate the industry without taking anything away from the established principles of tradition and history. It may be an over-marketed term, but I reckon it’s simply a good thing for one and all. Now, I know what you’re thinking….we’ve heard it all before….this is old news. Perhaps it is. But there’s a twist. The blog post above is word for word – bar a smidge of artistic licence – an article lifted from Mountain Biking UK (pg.25, Summer 2014 edition). 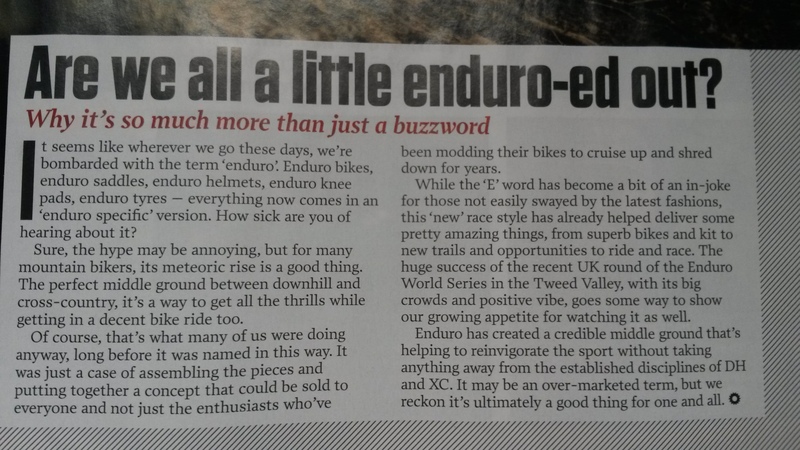 The article is talking about the recent craze, and growing sub-culture of the mountain biking fraternity – Enduro. I’ve subbed ‘Enduro’ for ‘Craft’, and I rather like the similarities. This was my second brewday in a 24 hour period, just so I can join in the with the Leeds International Beer Festival, homebrew competition! Very basic recipe, very brief write up. I thought I should stick with the pack and use a Tour de France inspired name. I quite liked Sticky Bidon “the term used to describe what happens when a rider gets a new water bottle from the team car. They tend to hang onto it for longer than necessary to get a free tow for a hundred metres or so“. 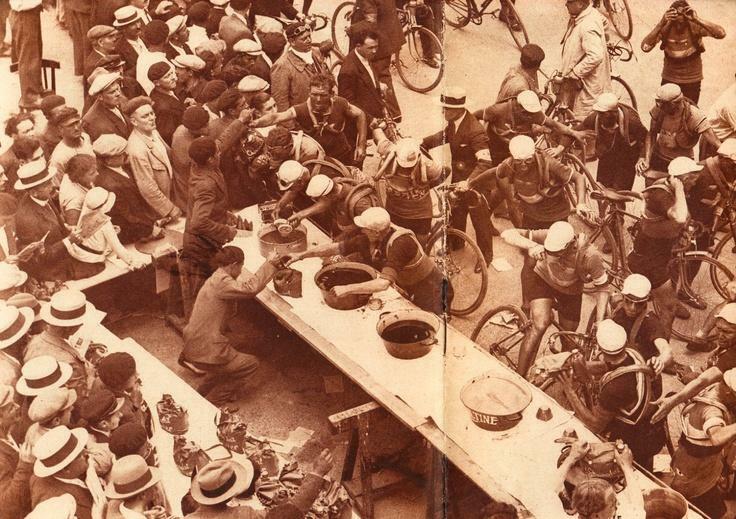 But, went with Feed Zone “a designated section of the race where riders pick up musettes from the soigneurs”. A talking point…OK! You can find the source of that interesting information and other Tour-lingo, here. Strike temp of 74C, 11.4L liquor for 4.37kg grain. Mashed in at 66C (single step infusion). Mashed for 75 minutes. Sparged at 76C 18.6L liquor. 60 minute boil. I collected 19L of wort, post boil, with an OG of 1.051. Pitched the yeast at 20C. I’ll be transferring to secondary and adding the dry hops. This will be my entry for the Thornbridge/Waitrose Great British Homebrew challenge. I’m a bit last minute with this brew, but it should be ok in time for the 31st July deadline. I’m hoping that someone will put me straight if I’m wrong here, but I’m thinking the lactose puts this beer into the Specialty Beers category; as it contains a “non-core brewing ingredient at a level intended to impart a distinctive and discernible flavour or character“. It’s my first attempt at a sweet stout, and after having tasted the wort, I decided that the amber malt has added a subtle biscuit flavour, and hope this carries through into the finished beer. For this reason, I’m calling this a Malted Milk Stout. Strike temp of 80C, 12.4L liquor for 4.83kg grain. Mashed in at 69C (single step infusion). Mashed for 75 minutes. First runnings 1.090. Sparged at 76C 18.0L liquor. Didn’t take a reading for pre-boil wort. 60 minute boil. At 15 minutes from the end of the boil, I added the milk sugar to the copper (which I had dissolved into 1/2 litre of boiled water), along with the immersion chiller and protofloc. I’m not sure what the final gravity will be, and the FG should (hopefully) finish a lot higher that the 1.012, but BeerSmith didn’t seem to account for the lactose, neither did it seem to adjust the FG when I raised the mash temp. 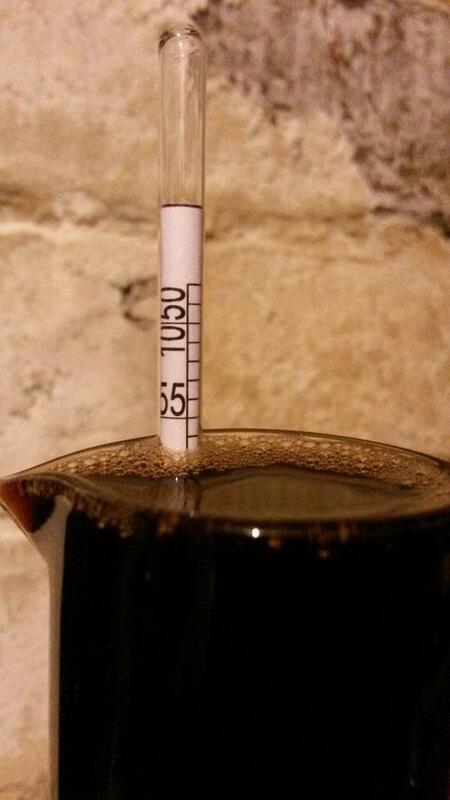 Hopefully it’ll finish nearer 1.018 and the 5.2% abv stout that I’m shooting for. Edit: It finished much higher – yet still within the BJCP style guidelines – at 1.024, making this a 4.4% beer. Tasting good! I collected 19L of wort, post boil, with an OG of 1.057. Pitched the dry yeast at 20C. 09/07 1.024 – bottled 18L / batch primed with 78g sugar. I don’t know enough about yeast, yet. I have White & Zainisheff’s book – Yeast: The Practical Guide to Beer Fermentation, and I should make an effort to read it through. Instead, I rely on yeast to do its thing – and do as many homebrewers do – focussing on the possibilities available through hops; malted barley and other adjuncts. This is not to say there aren’t homebrewers who aren’t students of yeast, nor is it to say that all commercial brewers would pass Pasteur’s inspection, were he around today. Yeast is often something brewers pitch nonchalantly into their precious hopped- wort, hoping that it doesn’t muck everything up after 8 hours of toil. I’ve used liquid yeasts, and have experimented with pitching directly from the vial, and with making yeast starters. My enthusiasm for liquid yeast has only waned because there is a need to plan ahead i.e. identifying a brew day, and working back 48-72 hours (or whatever the time required) to grow your yeast big enough for the intended wort. My brewdays happen on a whim. I see a break in the clouds, and go for it. Like many other homebrewers, this means that I rely on dried yeast. Yeast that will happily sit in it’s foil packet, high up in the fridge, alongside the parmesan cheese; eggs and a chocolate supply the kids can’t reach. Yeast that will be ready for action at a moments notice. Yeast that is reliable, and that will point it’s finger at you should the beer go wrong. I am of course talking about Fermentis Safale US-05, an American ale yeast which – in the right quantities – will make short work of even high-gravity worts, and won’t interfere with the flavours and aromas you hope to achieve in your blonde, pale, IPA, porter, stout etc. There are many other dry yeast strains available, but in my opinion, few can offer the reliability and ability to be sympathetic to fairly uncontrolled fermentation temperatures. It’ a gem. I shop for most of my homebrewing ingredients and sundries from The Malt Miller, and noticed they now sell their own West Coast Style ale yeast. I bought a sachet, and used it in a recent brew. I also brewed another beer a couple of days later, and pitched my usual US-05. 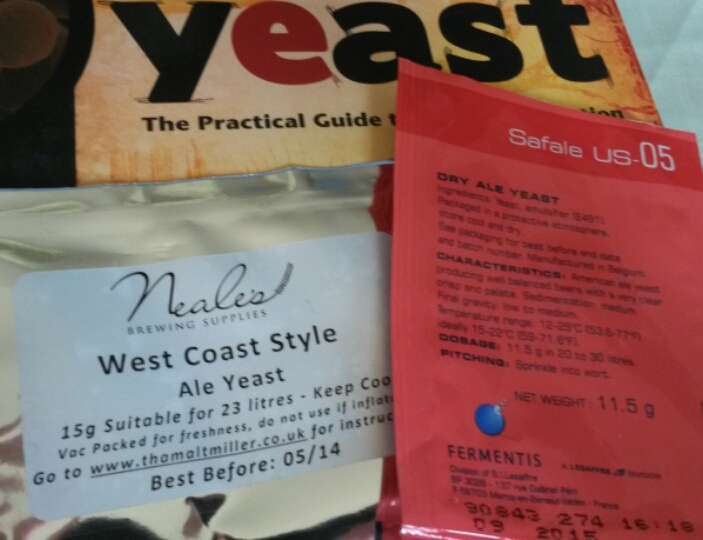 While this is not a scientific comparison (different recipes, no temp control etc), I thought it would be interesting to blog something anecdotal about their performance, not least because of a comment I received on the West Coast Ale Yeast – from Bob Arnott (@RecentlyDrunk). I took another gravity reading this morning and the Malt Miller yeast is stuck at 1.020. As suggested by a few folk on Twitter, I’ll get hold of some US-05 and pitch that. In the meantime, I’ve gently roused the beer in the FV. There is no reason why another brew, different temps, OG, etc. might suit the Malt Miller West Coast Ale Yeast, but I’ll be sticking with US-05 for the foreseeable. Although, I might give the Wyeast American Ale 1056 a chance too. Comments welcome below, or on Twitter (that’s usually the easiest way). I’m aware this isn’t the most thorough of posts, given the complexity of the subject, but hopefully a decent topic for discussion.